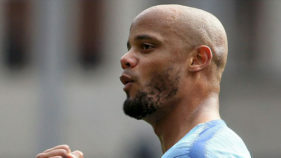 Manchester City conceded two penalties one that was squandered, one that was scored as they edged Napoli 2-1 on Tuesday to tighten their grip on Champions League Group F.
In a much-hyped clash of the highest-scoring teams in Europe’s five major leagues, City swiftly went 2-0 up through Raheem Sterling and Gabriel Jesus at the Etihad Stadium and looked set for another breezy win. But Napoli hit back, Ederson having to save a penalty from Dries Mertens before Amadou Diawara netted from 12 yards in the 73rd minute, and City manager Pep Guardiola will have been grateful for the final whistle. With three wins in three games, City are firmly on track for the last 16, while Napoli, who have won all eight of their domestic league matches to date, face a battle to progress after their second defeat of the campaign. It was only City’s second win in nine games against Italian sides, but although they preserved their 100 percent record in Europe this season, the way they let Napoli back into the game suggested they are not quite the finished article yet. Serie A leaders Napoli, meanwhile, must clear their heads quickly in time for Saturday’s summit clash with second-place Inter Milan. Stoke City left the Etihad with their heads spinning after losing 7-2 to City on Saturday and Napoli soon found themselves experiencing similar sensations as they fell 2-0 down inside 13 minutes. Sterling broke the deadlock in the ninth minute, alertly tucking away his eighth goal of the season after Kyle Walker’s effort from David Silva’s cut-back was blocked by Kalidou Koulibaly. Four minutes later a loose clearing header by Raul Albiol let City in again, Kevin De Bruyne seizing on the ball and surging past Koulibaly before crossing from the right for Jesus to tap in. City were flying, Napoli coach Maurizio Sarri’s face a picture of concern, and the hosts twice went close to extending their lead. 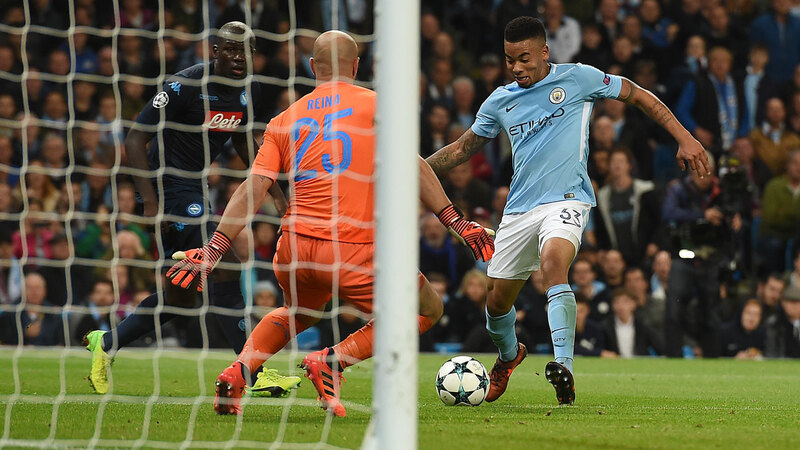 De Bruyne’s left-foot effort crashed back off the underside of the crossbar, while Koulibaly just about managed to clear the ball off the line after away goalkeeper Pepe Reina had taken the sting out of a Jesus snapshot. 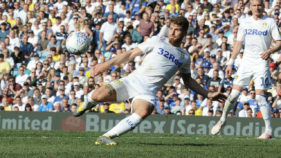 But as the half wore on, City took their foot off the pedal and they got a major scare in the 38th minute when Walker was penalised for wrestling with Albiol, only for Mertens to drill his penalty at Ederson’s legs. City continued to create chances Jesus being foiled by Reina and a last-ditch Albiol tackle either side of half-time — but their casualness in possession gave Napoli reason to keep believing. It took a desperate block from John Stones to prevent Marek Hamsik reducing the arrears after substitute Allan had robbed Fernandinho and with 17 minutes remaining, Napoli did claw a goal back. Faouzi Ghoulam’s surge from left-back was brought to a halt by a tired challenge from Fernandinho and Diawara succeeded where Mertens had failed, assuredly placing his spot-kick into the bottom-right corner. Mertens squandered a chance to equalise when he mishit an attempted chip from Callejon’s pass and City finished strongly, with Reina obliged to save from De Bruyne, Sane and substitute Ilkay Gundogan. But the roars of relief from City’s fans that greeted the final whistle told their own story.